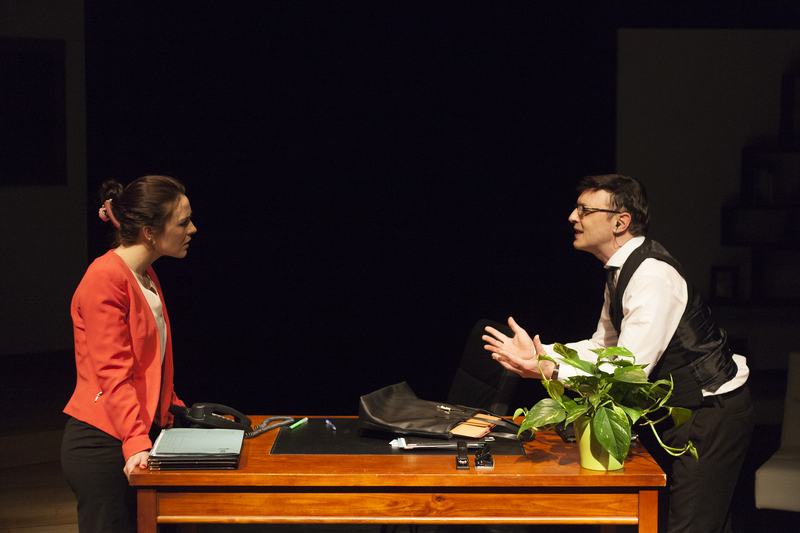 Theatre Review: Love or Money | SCENE! In the latest play from playwright Rosemary Jenkinson and theatre company C21, lawyer Eilish has just come out the other side of a ‘more acrimonious that matrimonious’ divorce, and is looking for love in…well, as it turns out, in all the right places! On her first date since the break up, and she’s met a man who might very well be the next Mr Eilish (not to get ahead of herself). There’s just one little thing standing in the way of their future happiness – the truth. With both parties lying their little cotton socks off, and the market for candy thongs drying up, things are looking grim. Of course, there’s one upside. The worse things get for Eilish and her hapless suitor as they try and navigate love and lex talionis, the funnier it is for those of us in the audience. Jenkinson, as always, delivers brutally funny one-liners and perfectly observed examples of life’s awkward engagements. And, as happened with Jenkinson’s last ‘ripped from the headlines’ play Stitched Up, C21 takes the wittily Northern Irish script and does it justice with a modern, modular set, sharp direction, and a cast that seem to be having a lot of fun with their roles. In fact, it is probably a credit to Stephen Kelly’s firm hand on the directorial wheel that the actors weren’t cracking up as they volleyed sharp, occasionally profane, witticisms back and forth. Kelly also does a beautiful job of choreographing the various scene changes that take place on stage – with dimmed lights and an almost visible ‘off-switch’ on the actors performances nudging the audience’s focus to where it needs to be on stage. Belfast actor Roisin Gallagher, who also starred in Stitched Up, White Star of the North, and Weddin’s, Weeins’ and Wakes, is charming and vulnerable as the conflicted lawyer, who has already risked her career for love once. With a mobile face and a willingness to pull unlovely expressions, Gallagher manages to simultaneous seem completely unself-conscious and act completely self-conscious. The introductory scene, as the characters finish up their first date with a night cap, is so perfectly awkward that I was cringing in sympathetic embarrassment at the fumbling attempts to be suave. Meanwhile, as the affable Conor (nee Sean), Michael Condron ( The Interrogation of Ambrose Fogarty, Macbeth, and Forget the Turkey) delivers a performance that makes it believable that someone like Eilish would take a risk on his character. As a character more sinned against than sinning, Conor doesn’t quite have the same range of material as Eilish does. Nevertheless, Condron convinces as the harried but good-hearted businessman – full of nervous energy and earnestness. However, it is Michael Liebmann (Macbeth, Whistle in the Dark, and Joyriders) who scoops the most laughs from the audience with his performance as the greedy, profanely exasperated lawyer Alec and the thong nomming, slightly vengeful shop clerk Travis. Both get the most ridiculous dialogue (I can’t spoil it! I want to, I was cackling at one exchange, but it has to be enjoyed in person), but Liebmann injects enough personality into his performance that it never veers too far into caricature. Well, Travis slides there a bit – but it’s hard to eat a candy thong seriously. With bras, candy thongs, scheming villains, and the world’s most awkward successful first date, Love or Money is another quality production from C21 and Rosemary Jenkinson. It’s a serious play, that doesn’t take itself too seriously. As for whether Eilish picks Love over Money, or the other way around? Well, you’ll have to book your tickets to find out. Love or Money is at the Lyric Theatre until 27 Feb and will be on tour from 29 Feb to 12 March. To find out more about Love or Money go to the C21 website.